Black ash and white ash are the main material that can impact the normal work of the concrete batching plant, for the water content of which is decided by many uncertain factors. Especially, the white ash, its digestion, quality, whether screening all affect the efficiency of the use. Therefore, it is important to know the appropriate water content before feeding the ash into the machine so as to to ensure the efficiency of construction, and guarantee the ash dosage. In addition, water content of stone also directly affects the production efficiency of concrete mixing plant. Too dry, it would be lost by wind; too wet, material would adhere to the hooper and not easy to drain. Especially after the rain, as its own characteristics of the stone, it may cause water content exceeding lopsided. 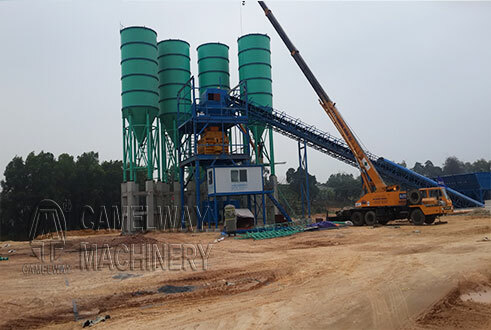 At this time, stabilized soil mixing plant in order to ensure that the mixing quality and mixing efficiency, can be used to balance the excavator overturned, raw material moisture content.